Hi loves! Today I am sharing some last-minute Valentine's nail art ideas since the "big day" is almost here. To be honest my boyfriend and I don't celebrate it, it's a bit overrated in my opinion ;-). But it's a good excuse to create some cute nails and if you use these stencils from Whats Up Nails you'll be left with gorgeous results! The Whats Up Nails Love Letters Stickers & Stencils sheet holds 5 rows of stickers & stencils containing the words LOVE, AMOR, XOXO, I♥U2 and KISS. 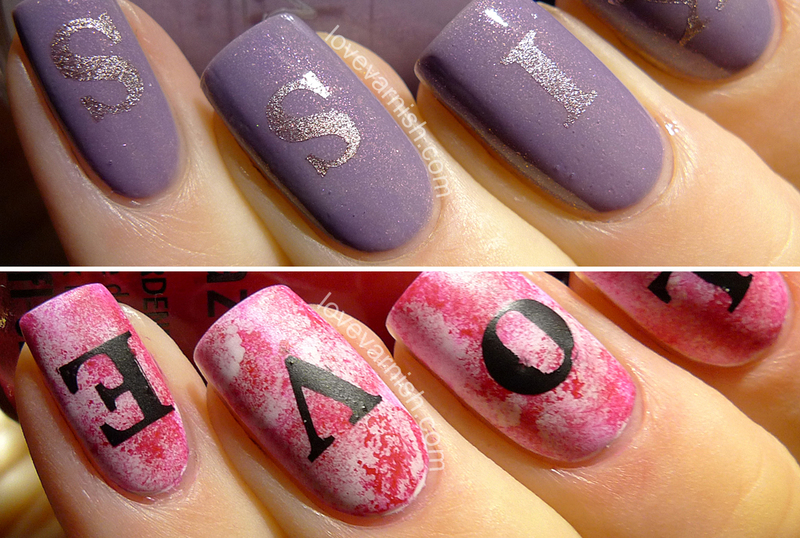 You can use the outer part as a stencil and you can peel away the letter inside and simply stick it on your nail as a sticker! My first look is a very simple one. I was already wearing my basecolor for a day and simple added the KISS stencils to my nail, sponged on Essie Penny Talk and removed the stencils following the lines of the letters a bit. I was left with a crisp result and finished with some topcoat. My second look is a bit more complicated, but not much ;-). I started with a white base and sponged on some pink and red and added a bit more white again to soften the look. I then added some quick dry topcoat and after that dried, the stencils. This time I chose the LOVE ones and sponged some black polish to make a bold contrast with my base. Finished with matte topcoat! I really love these stencils! They leave a clean, crisp result and they are quite versatile since you can use both the sticker and stencil for your look. The LOVE look is my favorite because the base is a bit more fun, but the delicacy of the KISS look is great as well. Which of these 2 is your favorite? And are you doing anything special for Valentine's Day? Tell me in the comments!